Your house, your apartment… that is part of your life and your worries. Where to live? What can I pay? How can I manage to save money and buy that house I have seen in an ad? Let’s begin with a plan. When a person takes a financial decision, he or she should not improvise, because he or she has many chances… to fail. 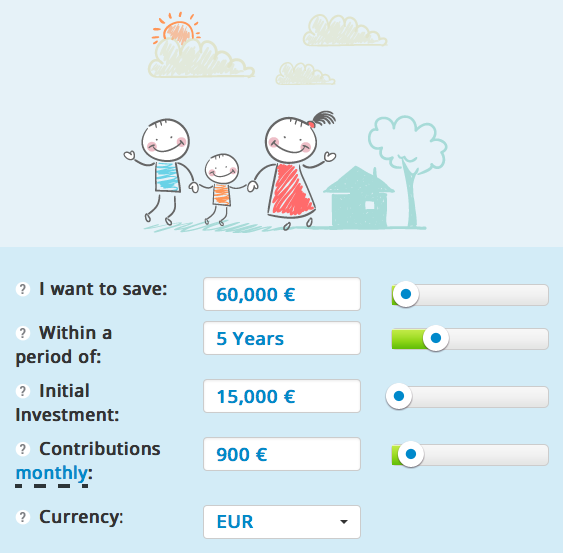 A plan is necessary: how to organize my savings? Any projections? What about the inflation effect? 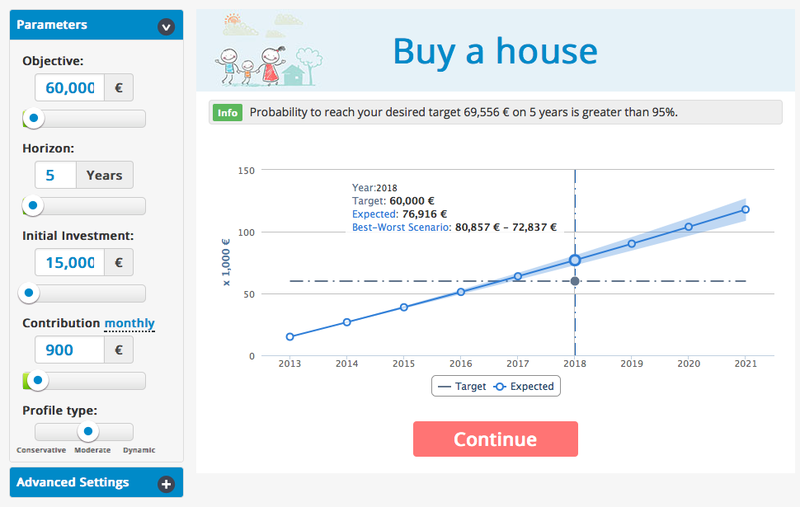 How much money do you want to save to buy your house or flat? How long are you going to save? How much money do you have already for this goal? How much do you expect to save every month or every year? Be realistic, look up your accounts, sum up the whole information for yourself and begin to fill in the fields. Let’s put an example: Your house costs averagely 200,000 euros. You need around 30% of this amount, because you are going to ask for a mortgage with a credit limit of 80% of the price, but you need some more money for taxes and associated expenses. So, you need around 60,000 euros. You are married, so two people contribute for the goal with 900 euros monthly: your expectation is that you reach it in 5 years, because you have already saved 15,000 euros. 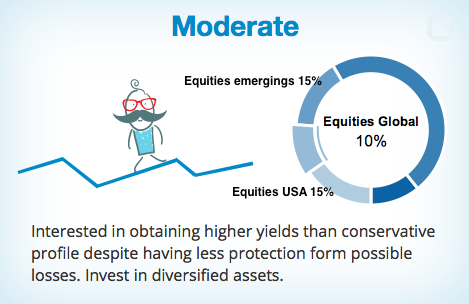 With these figures, our investment planner will ask you about your investment profile: how risky are you? You want to avoid high risks, but you are aware that a very conservative profile will perform slower. So, you choose “moderate”. If you are not sure, you can answer a short test. Finally, you have a chart that reports you about the chance that you have to reach your target. In this case, it is greater than 95%. The chart reports also about neutral and pessimistic scenarios. These figures are obtained through statistical calculations based on historical data. You can always set the parameters to evaluate other cases. You have also advanced settings to evaluate inflation and taxes effects. 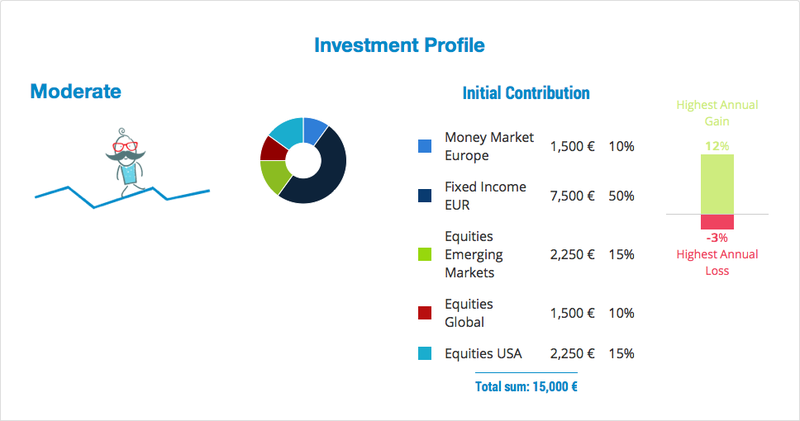 Last screen shows you a possible allocation of your initial contribution to your investment plan with a projection about highest annual gains and losses. Your wished house can be easier to buy if you develop your own plan. This is the reason why we offer these tools for free, so that everyone can access to professional solutions to success in their financial decisions. This entry was posted in T-Advisorpedia and tagged House, Investment planning, Mortgage, Risk profile, Savings on November 5, 2014 by Oscar Garcia.